One of the most important acronyms in nanotechnology is AFM – Atomic Force Microscopy. This instrument has become the most widely used tool for imaging, measuring and manipulating matter at the nanoscale and in turn has inspired a variety of other scanning probe techniques. Originally the AFM was used to image the topography of surfaces, but by modifying the tip it is possible to measure other quantities (for example, electric and magnetic properties, chemical potentials, friction and so on), and also to perform various types of spectroscopy and analysis. 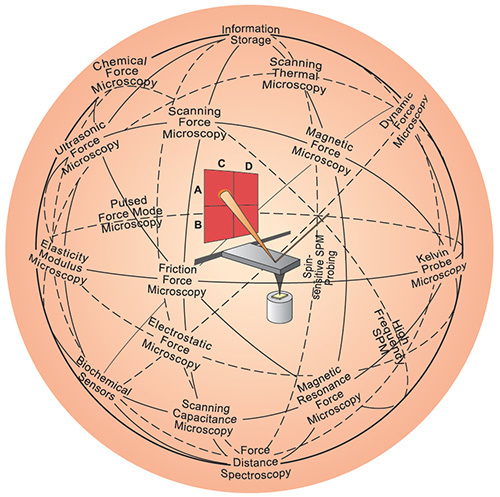 Well over 20,000 AFM-related papers have been published; over 500 patents were issued related to various forms of scanning probe microscopes (SPM); several dozen companies are involved in manufacturing SPM and related instruments, with an annual worldwide turnover of $250-300 million, and approx. 10,000 commercial systems sold. Read more on AFM here in our Nanowerk Spotlight: A key tool for nanotechnology: Atomic Force Microscopy. ICSPI makes the nGauge: the world's smallest, simplest and most affordable atomic force microscope. Scanning probe technology for soft matter, life sciences and nanobiotechnology. Nanonics is a nanoscale characterization company that manufactures scanning probe microscopes (SPM) and atomic force microscopes (AFM), with an emphasis on integrating them with other tools such as optical, spectroscopic, and electron microscopes. Among the more popular of these class if tools emerged the scanning optical microscope (NSOM/SNOM) and AFM-Raman microscope.